Affordable deals with growth potential are still available in sunny Hawke’s Bay, writes Louise Richardson. The drama of the General Election and a long, cold, wet winter, mean we’ve experienced a soft period in the market across most of the country. Sales slumped dramatically this winter – falling almost 25% across the board – yet there were regional markets that bucked the trend. 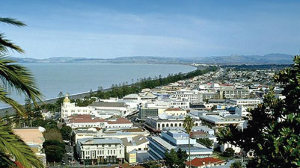 According to a recent QV report, in the sunny Hawke’s Bay, Napier City was one of the country’s best-performing sales’ markets, hitting an estimated median price of $449,717 in July, up $24,252 or 5.7% on a year earlier. Meanwhile, in Hastings District, prices soared by $70,605 or 20% over the same period, proving it’s a seriously desirable investing location. There’s significant cause for optimism across Hawke’s Bay with REINZ figures revealing a record-breaking median house price of $400,000 in July – that’s a 25.8% increase from the year before. Sales in the $1 million plus bracket in Hawke’s Bay have doubled, with thirty recorded in the first half of 2017, compared with only 15 in the same period last year. At least part of this rise across Hawke’s Bay appears to have been fuelled by a general exodus from big cities such as Auckland, and Wellington. Internal migration means buyers are finding their dream lifestyle is still attainable in the provinces where prices are much lower. Having investigated other locations, they can see that Hawke’s Bay has a lot to offer with its favourable climate and economic stability; the fast-growing wine industry, horticulture, farming, and logging industries form the backbone of the region’s consistently healthy economy. The result of this strength has greatly informed the current market, wherein properties are in short supply and tidy houses or units are snapped up quickly. Small-scale property investors have clearly been stung by the Reserve Bank’s loan-to-value ratio (LVR) rules, which in many cases have limited their ability to buy. The subsequent lack of new rentals is in turn affecting the availability of quality rentals of all sizes. And, because weekly rents in many parts of Hawke’s Bay have risen substantially over the past year, many potential private tenants are having trouble finding suitable homes for themselves and their families at a price they can afford. Philippa Pearse from QV notes that traditionally the majority of demand has been for a fully-fenced three-bedroom home with garaging in a tidy locality. “However, due to high demand and limited supply the requirements for tenants seeking accommodation has been minimised and the tenant has had to sacrifice these things just to get a property,” she says. This means that investors, to whom the LVR limits don’t apply, are active in the local market, and for very good reason. Rent-wise, there have been significant increases. Oxygen Property Management reports the median rent for a one-bedroom unit in July 2017 in Napier Central was $313, up 8% on July 2016. The difference was even more dramatic for a two-bedroom property; at $320, it’s up 12% while three-bedroom homes are bringing in $412, up 14% on July 2016. In Napier South two-beddies command a median rent of $310 per week, up 15%, year-on-year, with the figure for a three-bedroom home at $360 – up 6%. Down the road in Hastings, the rises aren’t quite so marked. The median rent for a two-bedroom property was $310, and a three-bedroom home sat at $360, up 7% and 2% respectively, while in Taradale, a two-bedroom home fetches $300 a week, up 5%. Three-bedroom dwellings were let out at a median rent of $377, up 2% year-on-year. When it comes to yield, latest QV statistics shows the median sits at 3.90% in leafy, gracious Havelock North where demand for properties is still high. In Flaxmere, yields are significantly better at 7.00%, while Hastings/Clive yields sit on 4.70% and rural Hastings is at 3.40%. Napier yields are sitting at 4.70% with Taradale/Awatoto on 4.00%. While O’Sullivan and her husband haven’t bought a property for about 15 years, she says the five they own in Hastings suburbs Mayfair and Parkvale are all good, steady performers, with reliable, long-term tenants and rents around $360 per week. In terms of current market activity, she says that there are still some nuggets of gold. “I’ve got a chap who has bought three properties in the last couple of months, and he can’t believe the fact that there are still bargains to be found. He’s buying three-bedroom houses in popular areas such as Flaxmere, and getting yields of 9-11%, while landlords elsewhere in the region are happy with about 6%. O’Sullivan says she also sees fleeing Aucklanders who keep their properties in the big smoke and purchase against them in Hawke’s Bay. “It makes sense if you can afford to,” she says. Jason Whittaker from Property Brokers in Hastings agrees. He specialises in matching prospective landlords with ideal properties for their needs and sells on average around 100 houses each year. “There are lots of enquiries from Aucklanders at the moment because getting an investment property that works for you up there is getting increasingly difficult,” he says. “Here in Hawke’s Bay and certainly in places like Flaxmere, you can sometimes still buy something for under $150,000. The tenants are definitely there and many will be renting for life now if they didn’t join Kiwisaver to help them get on the property ladder. We’re going to see investing very differently in future, now that buying your own home has got so hard for so many.